Valves are arcuate. The ventral margin of the valve is concave, while the dorsal margin is convex and broadly arched about the center of the valve. Apices are broadly rounded, with a weak point at the termination. A slight constriction is present between the apices and the dorsal swelling of the main body. Helictoglossae are visible near the apices, at the dorsal margin. The raphe curves around the apices onto the ventral margin. Striae are interrupted the sternum near the ventral margin. The striae are variable in their spacing, from regularly spaced to irregularly spaced. 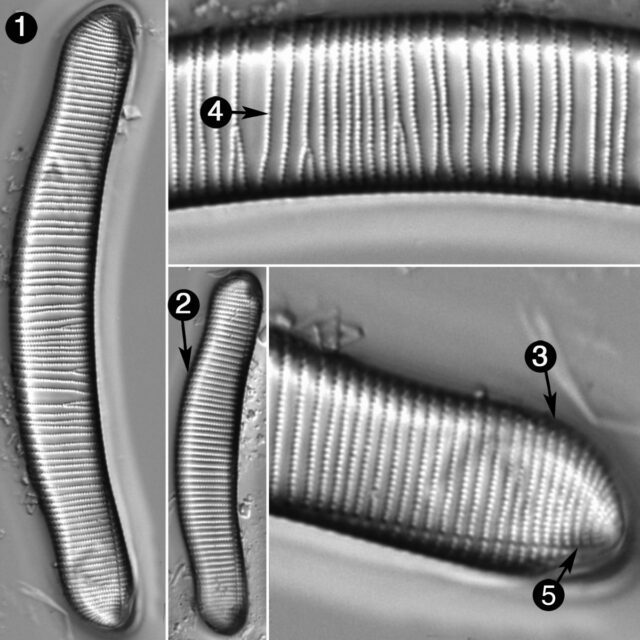 Areolae are distinct and number 23–27 in 10 µm. Originally, E. monodon was described based on syntypes from two separate locations in Mexico, Guadeloupe and San Miguel (Ehrenberg 1843). An iconolectotype of E. monodon was designated (Rumrich et al. 2000) based on the Guadeloupe illustration (Ehrenberg 1843 Tafel II, Fig. V: 7). In common usage, many authors have used the name “E. monodon” to refer to a taxon that was greater in length and width than the Guadeloupe iconolectotype (Lange-Bertalot 2011). 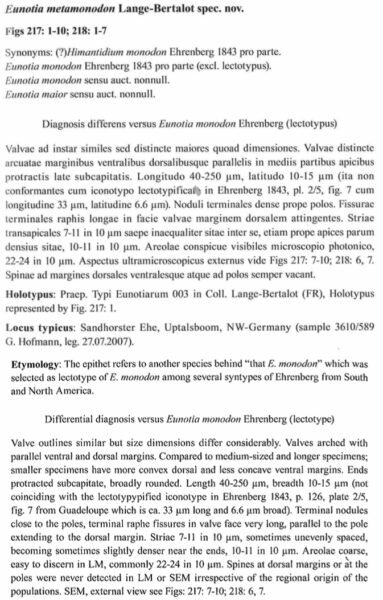 Lange-Bertalot recognized the discrepancy between the Ehrenburg illustration and the commonly reported taxon. In order to correct the discrepancy, Lange-Bertalot described E. metamonodon, a taxon based on specimens from Germany. This taxon accommodates the concept of “E. monodon” as used by many authors including Patrick and Reimer (1966), Foged (1981), Siver et al. (2005), Siver and Hamilton (2011), and Reavie and Kireta (2015). The size difference between the Guadeloupe iconotype for E. monodon and E. metamonodon was again made explicit in a recent volume (Hoffman et al. 2013). 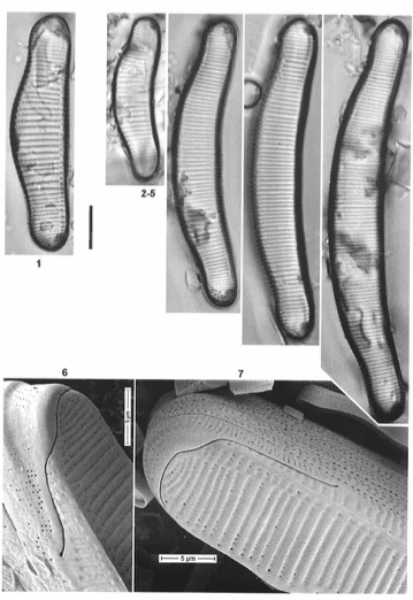 Patrick and Reimer (1966) report narrow specimens (< 10 µm) of E. monodon. Their illustration (Pl. 11, Fig. 6) , however, conforms to the concept of E. metamonodon. Further investigation is needed to confirm whether E. monodon occurs in North America. Eunotia metamonodon (reported as Eunotia monodon) is a cosmopolitan species distributed across North America in slightly acid to circumneutral water (Foged 1981, Siver et al. 2005, Siver and Hamilton 2011, Burge 2014) and is regarded as a halophobe by some authors (Foged 1981). Abundance ranges from rare in the sediments of Massachusetts and North Carolina lakes (Siver et al. 2005, Siver and Hamilton 2011) and the benthos of Quebec and Labrador rivers (Lavoie et al. 2008), to very abundant in Arkansas cypress-tupelo wetlands sediments and living in the epidendron (Burge 2014). Eunotia metamonodon is generally regarded as a nutrient-tolerant species living in oligotrophic to mesotrophic systems (Siver et al. 2005, Siver and Hamilton 2011, Burge 2014). 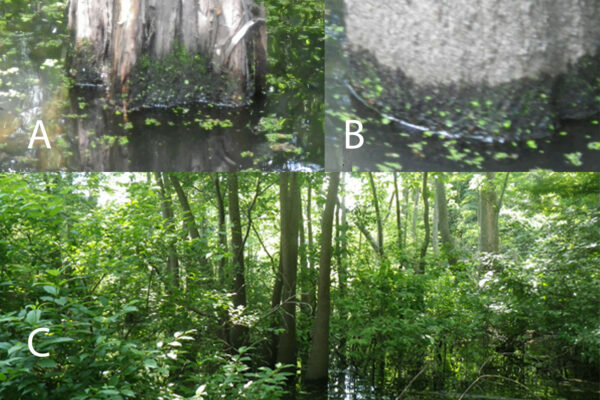 Burge (2014) found E. metamonodon occurring in 0.2% to 46.2% relative abundance among the epiphyton and benthos of cypress-tupelo wetlands with: 22.2–27.4 C, 5.6–7.4 pH, specific conductivity 71.2–834.0 µS/cm, 8.1–321.0 NTU, DO 0.1–7.7 mg/L, NO3-N 0.01–0.3 mg/L, NO2-N <0.001– 0.05 mg/L, orthophosphate 0.02–2.08 mg/L, and TP 0.11–3.93 mg/L. Other common species were Eunotia formica, E. bidens, E. bilunaris, and E. superbidens as well as species of Gomphonema, Navicula, Nitzschia, and Pinnularia. Sample site and substrates in the Cache River, Arkansas, where E. metamonodon was collected. Valve outlines similar but dimensions differ considerably. Valve arched with parallel ventral and dorsal margins. Compared to medium-sized and longer specimens; smaller specimens have more convex dorsal and less concave ventral margins. Ends protracted subcapitate, broadly rounded. Length 40-250 µm, breadth 10-15 µm (not coinciding with the lectotypified iconotype in Ehrenberg 1843, p. 126, plate 2/5, fig. 7 from Guadeloupe which is ca. 33 µm long and 6.6 µm broad). Terminal nodules close to the poles, terminal raphe fissures in valve face very long, parallel to the pole extending to the dorsal margin. 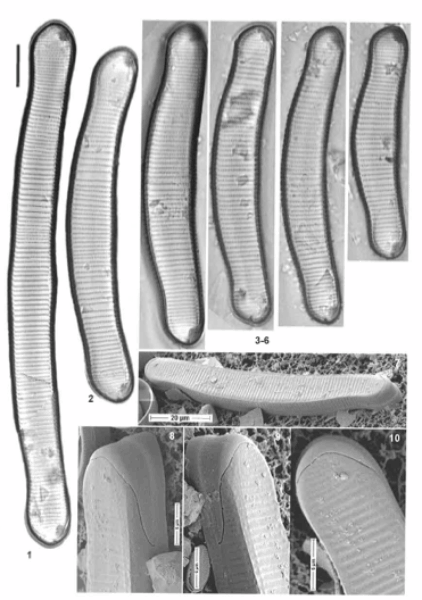 Striae 7-11 in 10 µm, sometimes unevenly spaced, becoming slightly denser near the ends, 10-11 in 10 µm. Areolae coarse, easy to discern in LM, commonly 22-24 in 10 µm. Spines at dorsal margin or at the poles were never detected in LM or SEM irrespective of the regional origin of the populations. SEM, external view see Figs: 217: 7-10; 218: 6, 7. Hofmann, G., Lange-Bertalot, H., and Werum, M. (2013) Diatomeen im Süßwasser-Benthos von Mitteleuropa: 2 Corrected Edition Koeltz Scientific Books, Königstein, 908 pp.